Christopher Koelle [blog]: Koelle skateboards. Rad. Popdeck, a skateboard design contest site, recently launched a new site called Deckpeck. 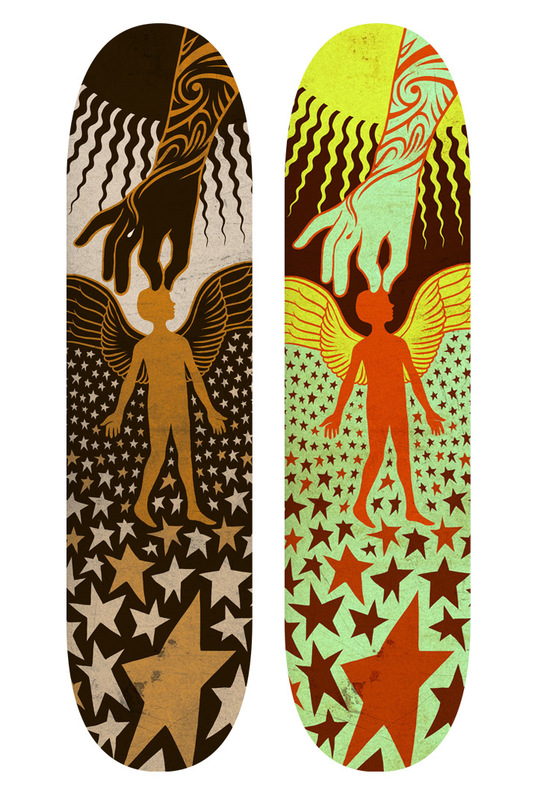 Designers upload skateboard and wheel artwork, and customers order the skate decks directly from Deckpeck. It's awesome for artists and designers to get their own boards made, and it's awesome for skaters to get cool decks and support the artists, who split the profit with Deckpeck. My decks are $50 each. Hey, Just looking at some of your art on your new site, I really like them - your portraits with the writing on them remind me of some of my cousins stuff; www.jackunruh.com - you have a great style, I'll definetly pick up your book from Portland Studios.